Sidi is a premium boot brand from Italy that is well known in the racing world, but the company also offers a wide range of products for non-racing riding, including street touring and everyday commuting. And one of these boots is their low-cut Sidi Fast Rain Boot that is designed to be versatile and comfortable, and capable of handling a variety of weather conditions, including, of course, rain. The new Sidi Fast Rain Boots are designed to be protective yet comfortable and, above all else, keep your feet dry when it’s wet outside. We found that they do all of these things extremely well. The Sidi Fast Rain Boots are built with a Technomicro and Cordura base with a waterproof and breathable membrane. 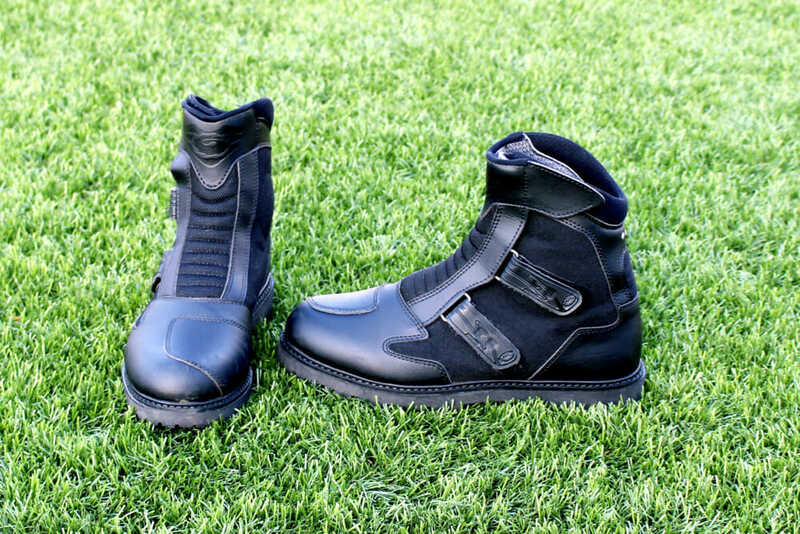 Two of the three securing straps on each boot use Sidi’s exclusive High Security Hook and Loop closure system, borrowed from the company’s bicycle department, that features additional plastic micro latches to keep them secure. Those little red plastic latches help keep the closing straps firmly locked in place. Internal heel, ankle and toe protection are built in and a full-length inner gaiter keeps the water out. They also include double stitching in all high-stress areas as well as a multi-paneled arch for comfort. The aggressive non-slip soles, designed to provide exceptional grip on both the footpegs and the ground, are glued to the boot. They can be resoled if ever needed. There are also three small reflective points above the rear heel. The Sidi Fast Rain Boots are quite stiff out of the box and require time to break in, but when they do, they fit very comfortably and you can easily wear them all day with no issues. The boot’s heavy-duty sole and internal protection provide a stiff, safe and confident feeling, yet the boots are again, overall, very comfortable, even when walking for long periods of time. We tested the boot’s rain resistance on several occasions and are happy to report that they perform as promised. Our feet always stayed dry. Since these boots are designed to be breathable and moisture wicking for sunny days, they are not really intended to keep your feet exceptionally warm, just dry. 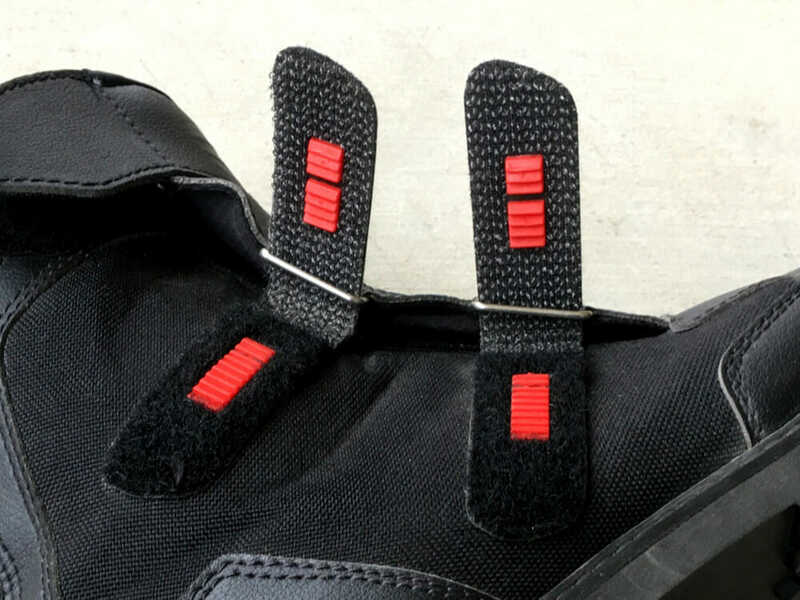 The three hook-and-loop (aka Velcro) closures make it quick and easy to take these boots on and off, and the plastic latch system integrated into the Velcro in two of the straps do, indeed, keep them very secure and should do so over a long period of time. Even after a lot of use, our Sidi Fast Rain Boots still look like new. 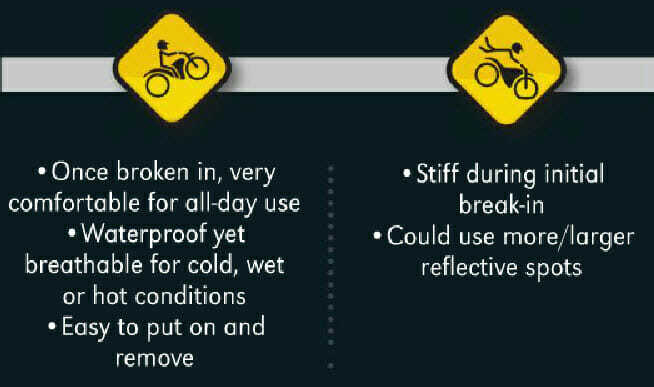 Overall, we found the Sidi Fast Rain Boots to offer good protection and stylish looks—both on and off the bike—and, as advertised, keep your feet dry when it’s wet outside. With a price of $175, we feel these boots are a great value.